Huey Lewis sang that it's "Hip to be square," but not if you're an Instagram user. Those who are subscribers to the picture-sharing app are so sick of squares, that they are probably ecstatic to hear about today's news. An update to Instagram now allows users to post their photographs in portrait or landscape, instead of the square shape that was the only option for photos since the app launched in October 2010. Back when Instagram was first listed in the Apple App Store, squares and square crops looked fine on the smaller 3.5 inch iPhone screen of that era. But five years later the app is offered on more platforms, larger and higher resolution smartphone screens are the norm, video capabilities are much improved, and Instagram users want more complex posting and editing options. Instagram says that 20% of photos and videos posted on social media are not in a square format. But up until now, Instagram never gave users the chance to post in other formats other than square. Now, when posting a photo or video, you can tap the format icon to choose between portrait and landscape. This means that your videos can appear in widescreen, as though you were watching them on the silver screen. And if you love using filters for your Instagram images, a big change has been made. Instead of offering separate filters for photos and videos, the same ones can be applied on both pictures and videos. 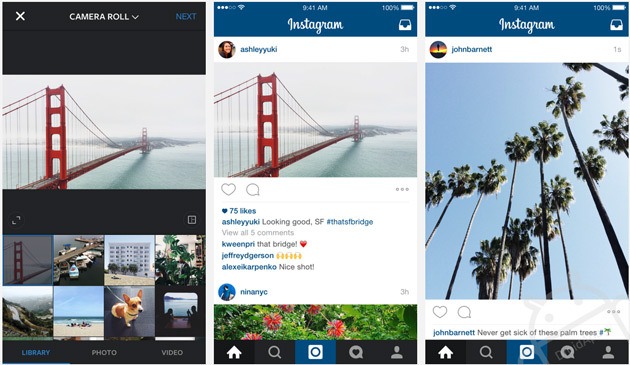 The new version 7.5 of Instagram is now available in both the Apple App Store and the Google Play Store. Here is the link of Play Store or you can download it via the APK from APKMirror.